The Drazi. For millennia they have fought... and fought... and fought. After being rescued from a crippled ship, a group of strangers is thrust into the middle of this simmering hotbed of violence, and given a front-row seat for a Drazi power play and a chance to observe some of the race's best and worst qualities. A case of mistaken identity leads to danger and adventure on the Drazi planet of Fendamir, assassins lurk around every corner and death awaits in the shadows as these strangers are forced to rely on their wits and brawn to survive on a planet where martial prowess is a way of life. 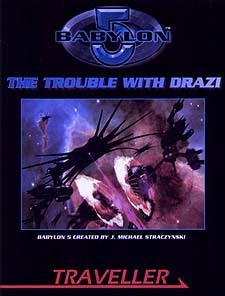 The Trouble with Drazi is a start up adventure using the Traveller system. You will require the Traveller rulebook and The Universe of Babylon 5 to play this adventure. To use this supplement, a Referee will require the Traveller core rules.